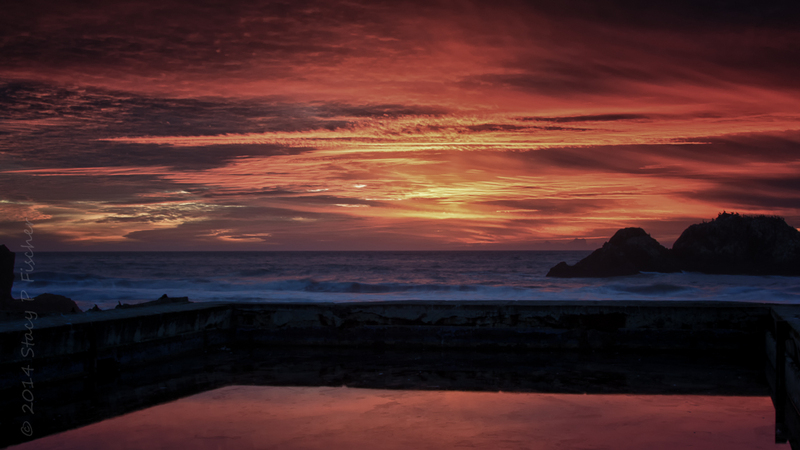 Historic Sutro Baths was the very first stop on my San Francisco sunset photo tour. 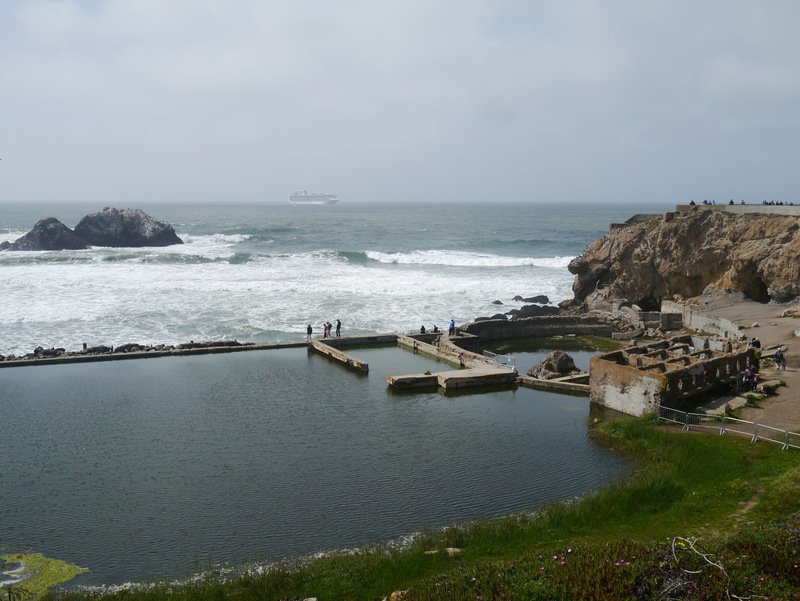 Located at the westernmost point of Lands End, the Baths was a lavish 25,000-person swimming facility and museum built in the 19th century by former San Francisco mayor Adolph Sutro. It boasted six saltwater swimming tanks, 517 private dressing rooms, restaurants, and arcades, all enclosed by 100,000 square feet of glass. Sadly, all was destroyed by fire in 1966. Today, the foundations are still visible, and the site has been part of the Golden Gate National Recreation Area since 1973. 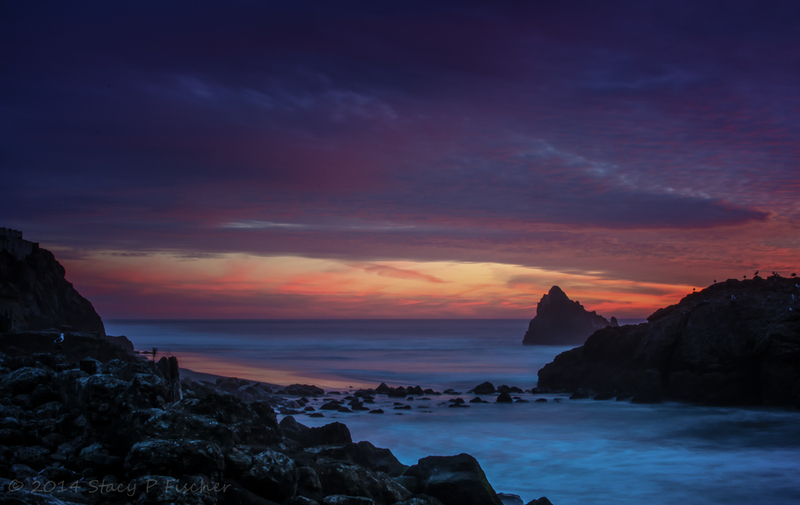 From my spot on the ruins, I pointed my camera south to photograph Seal Rocks while experimenting with water effects. I prefer the composition of the first, but the exposure of the second. As I swung my camera back around, with the sun’s fading orange glow giving way to the evening’s blue hour, this is the scene that was waiting. This guy had all of us witnessing the scene sigh a big, collective “awwww.” And if you’re wondering, she said yes! Sutro Baths, gone? Yes. Forgotten? 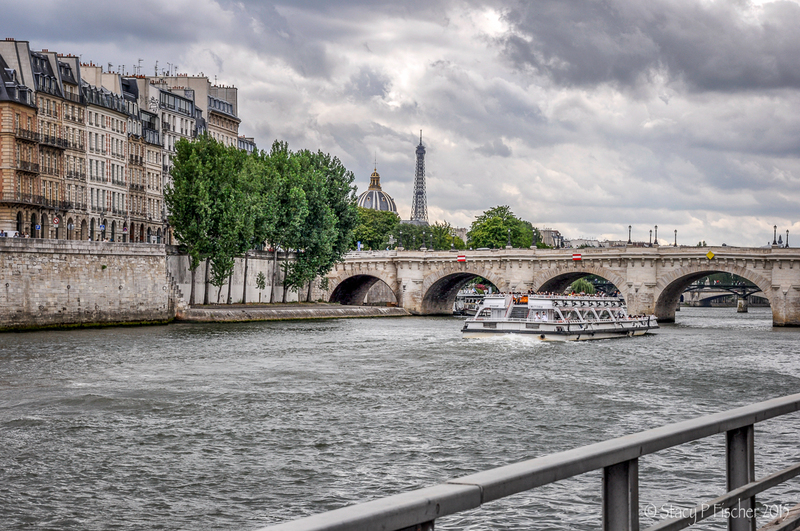 As a popular spot for photographers, tourists, and romantic locals, I think not! 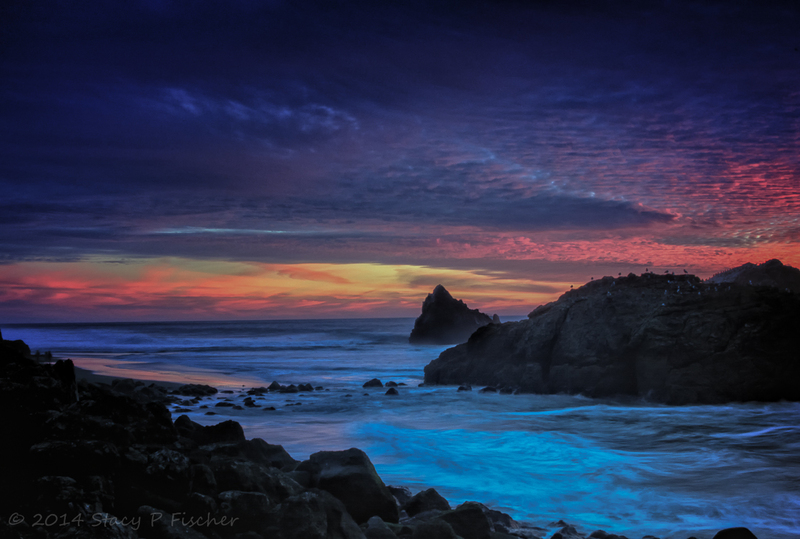 Thanks to Sally Mason of Little Hiccups for allowing me the use of her photo, Looking Over the Sutro Baths. This entry was posted in California, Landscapes and tagged golden hour, night photography, photography, postaday, San Francisco, sunsets. Bookmark the permalink. Love them! Colors, light and landscape are beautiful! And as icing on the cake, the wonderful proposal picture! Compliments! Hi, West! It’s such a beautiful spot. I hope you get a chance to get there one day! Hope you had a wonderful holiday season – happy New Year to you!! I used to love the Sutro Baths. We used to hike to and around them when I was in college. You’ve really captured some beautiful images and a great sunset! Love them all! 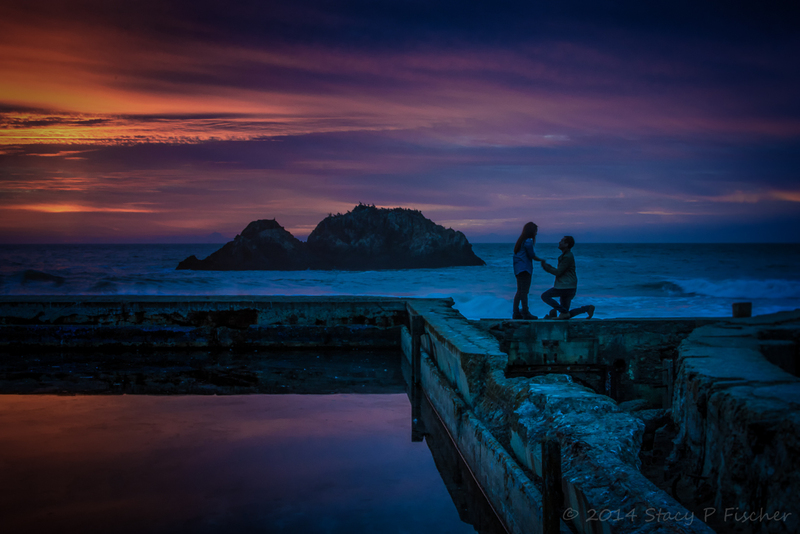 Love the proposal picture ! It made me gasp. Thanks so much, Justine. Magical is a great word to describe the entire experience! The colors are absolutely gorgeous! Awesome shots all around. Thanks so much, Luis. I was glad I could do the scenes justice. Great images, Stacy. I remember the Sutro Baths, but I was there at midday with cloudy weather. The history of that place is fascinating and worth a visit even with poor shooting conditions. You definitely came back with some real winners. Nicely done. Wow, those colours, that story – all perfect Stacy. I don’t know how you do it, but I wish I could take photos like that. If I get what I want for Christmas, then maybe I can (with a little help from you 🙂 ). Whow!! Great photography. Love the colours. Compliments!!!! I recall this gorgeous place in the daylight hours. You’ve offered another prospective. Well done. Thank you so much for these beautiful photos and moments, Stacy! Oops I meant to say that I’ve never seen the baths photographed this way. You did a fantastic job. Thanks, Laura! I’m curious though – do you mean at sunset? Or from the vantage point of the walls? I had an intrepid guide who I just blindly followed behind, up and down, in and out, wherever he went. At this spot, I needed a bit of steady hand holding as we traversed those walls in the dusk. Yikes! I meant with those colors and the vantage point both. The way you processed them too…I’m assuming you did *something*…they look wonderful! Fabulous sunset images, and what a place! Thanks, Sue! Had I not been with a guide, I doubt I would have ever found this wonderful place – I mean there are so many iconic places to visit in San Francisco, but this is an incredible gem at sunset/sunrise! Serendipity is a wonderful thing! WOW! WHAT stunning photography of a San Francisco sunset! Such a romantic picture! I did not see the baths when I was there. So thanks for sharing!! Thanks, Nancy, and you’re very welcome 🙂 I had so many shots, it was difficult to pick the handful that I did. I can see why this young man chose to propose here! Beautiful place and totally awesome sunset photos! Cheers to the couple! I think she’s got herself a winner 😉 Thanks, Cardinal! Gorgeous amazing sunset. Those colors. And that cute couple, romance is not dead.